People think that tea comes from a many number of tea-plant species since there are so many types of tea that we are accustomed to drinking. After going to a tea tasting at a place in Portland, Maine called Dobra Tea, I learned this was not the case. When we hear white, black, or green tea we may assume that it might be due to the plants being close to those colors or how the leaves are. There is so much more about tea that I never knew until I went to this tea tasting. Camellia sinensis is the tea-plant species and the differences in types of tea are due to us humans. Differences in each taste is due to altitude, climate, and how the plant leaves are handled after being picked. The process used for each type of tea has its own special method. Some tea farmers/factories won’t even allow you to watch how they make their tea due to the secret of timing and what temperatures they use during their production of tea. I got to see photos of the tea fields and watch as they made Black tea by drying the leaves to make them more pliable. They toll the leaves to get the juices to rise and then oxidize them in humid rooms. The black color comes from this process. Finally they use hot large bowls or ovens to destroy enzymes in the leaves to keep it from continuing to oxidize. 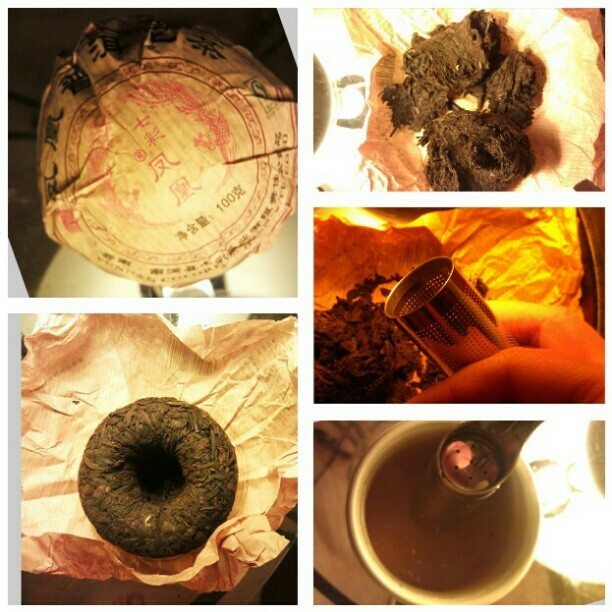 My friend Matt actually told me that Pu-erh, a fermented black tea, tastes better with age like a fine wine. Oolong teas is a semi- oxidized tea. It is a mixture of how Green tea and Black tea are made. Green tea is not left to oxidize and are put into the oven or hot bowl so that it won’t oxidize at all. The Oolong teas can be placed into baskets to shake or be walked on. It really depends on the factory.The White teas are completely different because they are limited to how they are processed unlike the others. These leaves are only steamed and dried so that the leaves are unharmed. I consider them almost delicate of the teas because of how they are treated. Measure the desired amount of tea leaves and place into a teapot or teacup. Use 2 tsp or 2.3g of Puerh tea for every 8oz (1 cup) of water. Bring the water to a rolling boil at 212oF (100oC). Add enough boiling water to submerse the tea leaves and let it sit for a few seconds before pouring out the water. Warming the tea leaves and teaware allow for a better brew. Add boiling water and let the tea leaves steep for 3 to 5 minutes. EDIT: My cousin Jill was telling me after I posted this a few minutes ago about this a guy she knows in NM who was looking for “some kind of business” he could start, and he started the New Mexico Tea Company. He was a design major. Show love and support to this man for starting an awesome business.